A breathable waterproof jacket ,or a water resistant breathable jacket, both terminologies can be confusing .I will try to help demystify the two terms. In my mind a truly waterproof fabric is one which does not allow water penetration at all. Irrespectively of the degree of water pressure applied ,it will not leak.But in reality the textile industry has got a different definition. For a fabric to be classified as waterproof it needs to withstand water pressure applied from a 1m high column, and not leak. (Some countries feel 1.5 should be the cut off point).This approach tests the fabric’s resistance to water penetration. If the fabric withstands water pressure applied from a 1m ,1000mm (or approx 4 feet ) water column, it is said to have a “hydrostatic head of 1”.If the fabric withstands water pressure applied by a 2m water column, it has a “Hydrostatic Head of 2”.So to follow on, the fabric or a jacket will have a better water-proof ness if it has a water head reading of 2 ,rather than 1. From now on I will use the term waterproof to apply to a ski jacket, if it has a hydrostatic head of 1 and higher. How is this relevant to skiing? Being exposed to a blizzard, heavy snow ,hail and rain, wearing jackets with low hydrostatic head reading will allow them to become wet and porous very quickly.The jackets, which have higher hydrostatic head rating will withstand the blizzard better. This is because the fabric can withstand higher water pressure. Think of this analogy as ,someone sprinkling you with water,as opposed to you being hosed under high pressure.What sort of weather are you ready for? 1/ If you are venturing well beyond ski patrolled boundries ,going into extreme blizzard weather, consider a breathable waterproof jacket with a hydrostatic head rating of 20 plus ( 20,000mm). 2/ If you are reasonably close to civilization, and may be able to find shelter from extreme climactic conditions should a blizzard arise,than 10 hydrostatic rating is sufficient. 3/ If you are looking for a breathable waterproof jacket that offers some versatility and does not break the bank account, consider rating 8. 4/ For most of us skiing in patrolled areas, without the weather being too uncomfortable, clear shiny days ,a hydrostatic head rating of 3 should be sufficient.These are not the best for precipitation. What attributes make up a breathable waterproof jacket ? Micropores which make up the physical dimensions of the fabric are important. The outer pores of the fabric are smaller than the physical dimensions of water droplets,or snow flakes.The pores, however, are big enough for vapour to pass through. 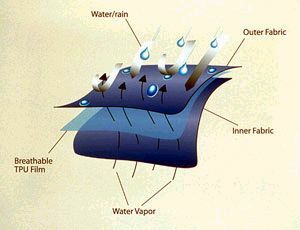 Ionic charge attained through fabric treatments is also important.The manner in which the fabric layers are treated and laid together is such that the outer surface of the breathable waterproof jacket is water hating, or hydrophobic, and the inner layers are hydrophillic, or waterloving. The net effect is moisture ends up being drawn away from the body. Think of it as magnets having two poles. Two like poles will repel, and two opposite charge poles will attract.If we assume the vapour molecule has a positive charge,than having inner jacket insert of a negative charge will attract that vapour molecule.In effect drawing vapour away from your body. Why is it important to have a jacket which breathes? All the perspiration that accumulates under the outer wear ,or any part of your waterproof breathable jacket or garment will condense. Continual condensation will cause fluid build up until soon your inner insulating layers become wet. If you are wet ,you’ll become cold very quickly. How do we measure breathability?. c/ sweating hot plate-measure moisture loss due to heat application, similar to our skin heating up to influence rate of evaporation of vapour. One outcome is a mathematical figure which tells us how many grams of water vapour have diffused,or passed through a 1 m2 of fabric in the time of 24 hours .In other words how much in this case vapour will pass through a section of a fabric in 24 hours. This figure is quoted as ie 10,000 gm / m2/ 24hrs. For recreational use chose fabrics with minimum breathibility as shown above. Be mindful however,that a breathable waterproof jacket which has a very high waterproof rating of 20 plus, or even 45, being usually triple layered ,will not attain a very high breathibility, usually less than 12,000 gm / m2 / 24hrs. Another outcome of performing the above testing ,is the RET figure (resistance of evaporation of a textile).This figure is quoted as ie RET= 60. Since we measure resistance, the less resistance we have the better. So RET = 60 has better breathibility than RET =90. 1/ If you are quite an endurance skier ,who can put out quite a prolonged physical performance, look for extremely breathable jackets RET < 60. Some waterproof breathable jackets will give you RET = 45. Wow quite impressive! On the other hand, if you are just starting out, feel your fitness is on a climb, may perspire a lot as your body adapts to increasing physical effort, this RET rating may also be exellent for you . 2/ If you are reasonably fit, and don’t perspire an awful lot after a full day skiing, RET < 95 will suit you down to the tea. 3/ If you take skiing as more of a leisure activity done a couple of hours a day, perhaps few weeks a year,a RET < 120 will be quite sufficient .In fact this will be plenty. Caught up in fabrics? Do not forget to ask if stitched lines are sealed. This is the only way to truly waterproof fabrics. Glues and resins are used to impregnate the fabric at it’s seams to fully seal it off. Full saturation of the fabric has to occurfor effective seal. If you would like to check out what winter jacket features you ought to expect on your jacket visit our page here.We cover features and attributes that a skier should expect out of their jacket. In case you are wondering where do goose down jackets fit into the scheme of winter jackets, check our page out. If you would like to know some technical details on fabrics, I have complied a list of breathable waterproof jacket’s fabrics , including their waterproofness as well as breathibility characterictics. Perhaps you are looking for our experience on importing ski jackets from China visit here. From breathable waterproof jackets back home.